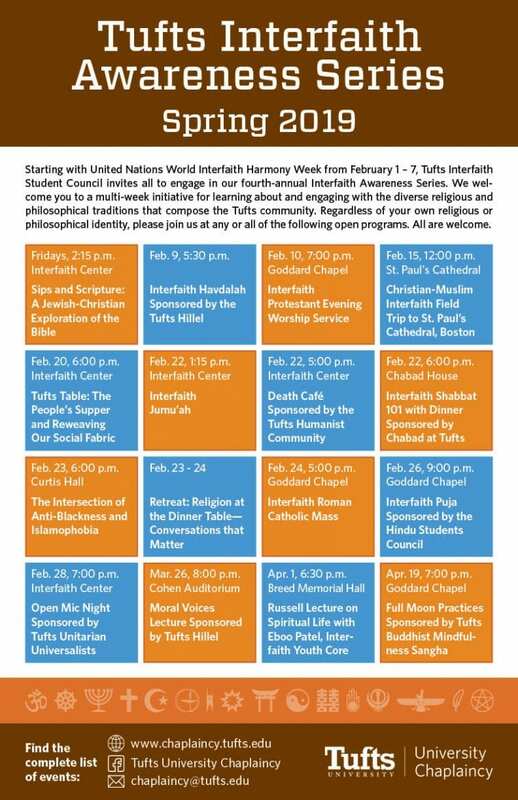 Starting with United Nations World Interfaith Harmony Week from February 1 – 7, Tufts Interfaith Student Council invites all to engage in our fourth-annual Interfaith Awareness Series. We welcome you to a multi-week initiative for learning about and engaging with the diverse religious and philosophical traditions that compose the Tufts community. Regardless of your own religious or philosophical identity, please join us at any or all of the following open programs. All are welcome. This interfaith scriptural study group allows each of us to learn from the insights of individuals as well as traditions surrounding their central and authoritative texts. Sips and Scripture will be a chance to dive into Biblical texts from each of our unique perspectives while sipping on tea or cider. All are welcome. For more information please contact Protestant Chaplain Dan Bell at Daniel.Bell@tufts.edu. For more information, please contact Tufts Hillel Interfaith Student Council Representative, Vera Zanker. Are you interested in learning about service- and justice-oriented programs after college? Come for a free dinner conversation co-sponsored by the Catholic and Protestant Chaplaincies. Representatives will be visiting to talk with you and share about their programs. They include the Young Adult Volunteer Program, Life Together, and the Loretto Volunteers Program. These are progressive faith-based organizations dedicated to serving others in solidarity, promoting justice in community, deepening spiritual awareness and vocational discernment, and living simply in intentional community. If any of these things speak to you, or you’re just curious, please join us. All are welcome, regardless of religious or philosophical background. Please email Catholic Chaplain Lynn Cooper (lynn.cooper@tufts.edu) or Protestant Chaplain Dan Bell (daniel.bell@tufts.edu) if you have any questions. Facebook event here. Mira Guha, A19 preaching. Sponsored by the Protestant Students Association. Sponsored by the Muslim Students Association and the Protestant Students Association. Join the Office of the Provost, the Chief Diversity Officers, and the University Chaplaincy for a Tufts Table in the format of The People’s Supper. The People’s Supper was developed by the Tufts alumna, minister, and interfaith leader The Reverend Jennifer Bailey, A09 after the 2016 Presidential Election to help to “reweave our social fabric.” It is a model for building bridges across the divides of politics, religion, values, and other differences. Tables will be co-hosted by Tufts’ chaplains and members of the Interfaith Student Council. To RSVP, please visit: https://tuftstablepeoplessupper.eventbrite.com. For more information, please contact chaplaincy@tufts.edu. Death Cafés are an opportunity for people–friends and strangers–to gather together, drink tea, eat cake, and discuss thoughts and feelings around death, dying, and mortality. These discussions are facilitated but with no agenda beyond creating an accessible and respectful space to connect with others. The Tufts Humanist Chaplaincy will host an open death café on the late afternoon of Friday, February 22, including dinner. All are welcome, including and especially people of various religious and philosophical identities. For more information, please contact Humanist Chaplain Walker Bristol at Walker.Bristol@tufts.edu. 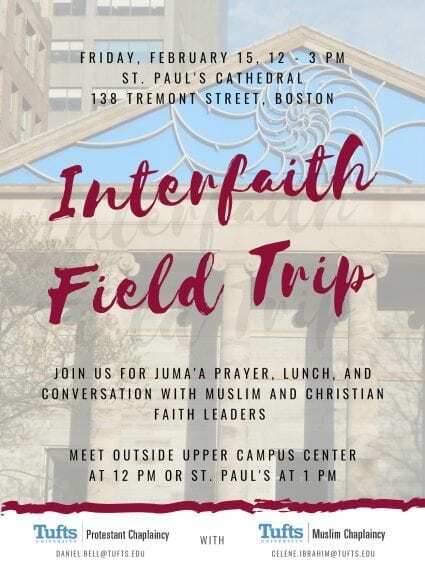 Join us for the 2019 Boston Interfaith Leadership Initiative (BILI) Student Retreat entitled, “Religion at the Dinner Table: Conversations that Matter” on February 23-24 at the Walker Center for Ecumenical Exchange. This gathering is sponsored by the Miller Center for Interreligious Learning and Leadership of Hebrew College and supported by a grant from the Of Many Institute for Multifaith Leadership at NYU. The retreat is organized by a team of local undergraduate students from Bentley University, Boston University, Brown University, MIT, Northeastern University, Tufts University, and Wellesley College. The retreat is open to undergraduate students from across New England with an interest in interreligious dialogue, study, and action. This includes people who identify as religious, secular, spiritual, atheist, agnostic, or otherwise. It will include skill-building workshops, story sharing, panel discussions, informal conversation with religious and civic leaders, educators and activists, and your peers. More information is available here: https://goo.gl/forms/KS9wFDPxnFcSwGqn2 and here is the link for the registration page:https://goo.gl/forms/KS9wFDPxnFcSwGqn2. Come and tell stories of faith, play music, tell stories of music and have fun with the Tufts Unitarian Universalists and the Humanist Community at Tufts! We will be serving tea and scones. Nicholas Kristof, New York Times Columnist, two time Pulitzer Prize winner, and CNN contributor joins the Tufts Hillel Merrin Moral Voices to speak on the topic of immigration. Often hailed as one of the most important journalists of our time, he will be discussing the media coverage of immigration through the past few presidencies. This important event will take place at 8pm in Cohen Auditorium. Tickets will be available for the greater Tufts Community on Tufts Tickets and at the Campus Center Ticket Booth starting March 11th. Join Tisch College and the University Chaplaincy for a conversation with author, educator, and interfaith leader, Eboo Patel. 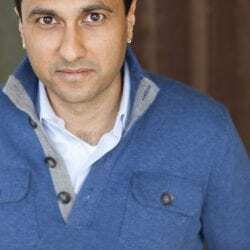 Patel is the Founder and President of Interfaith Youth Core, the renowned national nonprofit that brings young people from different faiths together to work on social action projects, fostering cooperation instead of conflict among youth of diverse beliefs. Named by U.S. News and World Report as one of America’s Best Leaders, Patel also served on President Barack Obama’s Inaugural Faith Council and partnered with the White House to launch the Interfaith and Community Service Campus Challenge in 2011. He is the author of four books including, his autobiography Acts of Faith and his recent book, Out of Many Faiths: Religious Diversity and the American Promise. A recipient of numerous awards and honorary degrees, Patel is a member of the Young Global Leaders network of the World Economic Forum and was recently selected as one of five future policy leaders to watch by Harvard University’s Kennedy School Review. Follow the conversation live at #EbooPatelAtTufts. This event is presented by the University Chaplaincy Russell Lecture on Spiritual Life and the Tisch College Distinguished Speaker Series. You can learn more about the Russell Lecture, Tufts University’s oldest lectureship, here. RSVP requested at tischcollege.tufts.edu/content/eboo-patel. practice that is connected with the full moon or with the moon more generally? Are you curious to hear how people of different backgrounds find meaning in the symbolism of the moon? Join us! All are welcome. A light dinner will be provided.